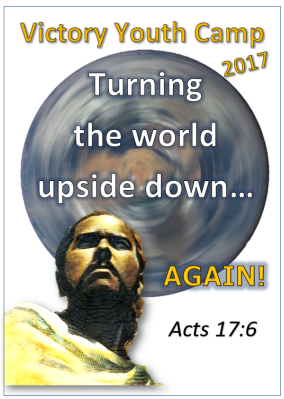 Turning the world upside down through the Gospel of the living Saviour, Jesus Christ! I invite you and the young people of your church to be a part of Victory Youth Camp 2017! This year’s Camp will change the way we see the world, that it truly needs to be turned upside down AGAIN! The Apostle Paul is our example this year, and we will look at his past, his heart, and the effect of his one life that still resonates today! If you want your young people to have more than a just a good time, send them to this year’s camp, and let’s see if God raises up another “Apostle Paul”. Our world sure could use one! The Cost is €110 per person, and is for ages 7–18 years old. Download, fill-in the Permission form, and post it back to us TODAY! What in the World Was Paul Doing? Boldly Going to the Uttermost! 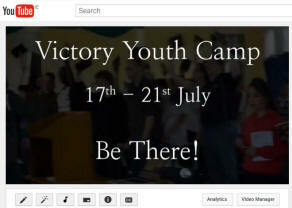 Victory Youth Camp (VYC) is open to children and teenagers between the ages of 7 to 18. VYC reserves the right to make date/venue changes if necessary. VYC will operate to the highest safety standards. In consideration of the acceptance of above named student(s) in VYC, the applicant's parent/guardian agrees that VYC and / or their volunteers will not be held responsible for any accidents or loss of personal property, however caused. Any participant whose conduct is deemed by the VYC director to be detrimental to the best interest of the programme will be dismissed from the Camp, and sent home - possibly requiring the parents to come and pick them up from the Camp. VYC reserve the right to modify or delete any scheduled activity in the event of unforeseen circumstances. By signing the above form, permission is granted to seek medical treatment in the event of an accident, if deemed absolutely necessary, and their parents/guardian will be immediately contacted. Photographs/Videos may be taken for promotional use. If your child or teen has any food allergies, please inform the Camp.